Grant Bilker and Junelle Corcuera — Flute duet. 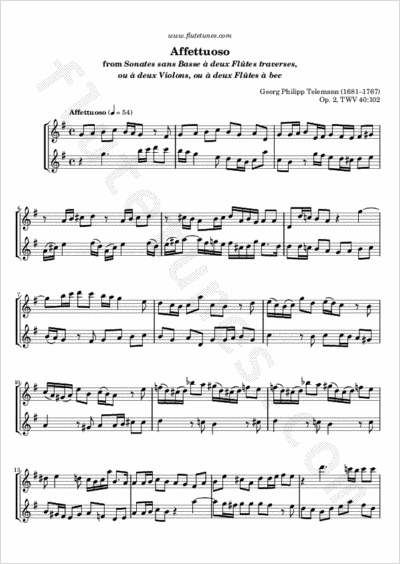 Here is the third movement from the fourth of Telemann's Sonates sans Basse à deux Flutes traverses, ou à deux Violons, ou à deux Flutes à bec, or “Sonatas without Bass for Two Transverse Flutes, or Two Violins, or Two Recorders”. This slow movement is marked “Affettuoso”, which in Italian literally means “affectionate”, “tender”, “warm-hearted”.